Lost in Boston? Don’t just blame it on the old cow paths. The confusing nature of navigating Boston is commonly attributed to the winding, crooked streets — formerly cow paths, or so the legend goes — that curve and jumble with no particular sense of a larger organization, à la the Financial District. 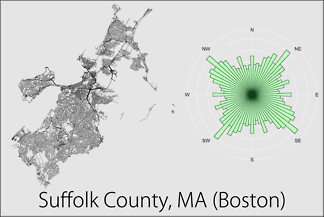 But a scientist and data visualizer in Portland, Ore. may have identified another reason why driving, cycling, or walking in Boston can be so mystifying: streets’ lack of orientation to north, south, east, and west. Kadish came up with a collection of graphs to assess 12 different cities’ adherence to the familiar north-south-east-west directions. Each looks somewhat like a star, with bars radiating outward at various angles. The length of each bar corresponds with the number of city streets oriented in that direction on the compass rose. The cities that adhere most strictly to a North-South-East-West grid, such as Denver and Chicago, end up looking like a neat plus-sign. 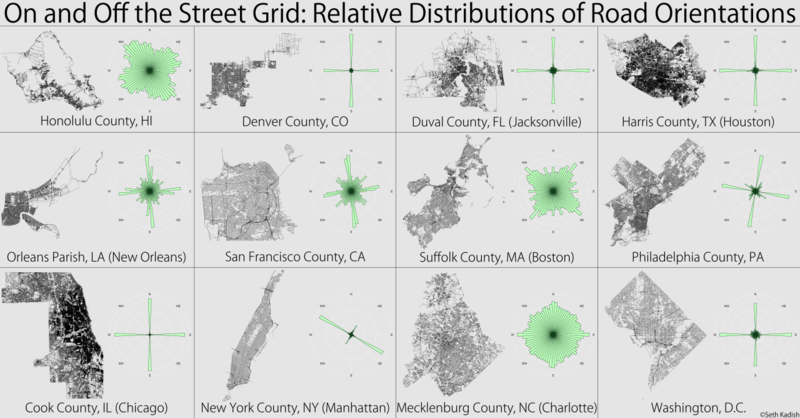 Others, like Charlotte, N.C. and Honolulu, lack any kind of grid structure and look like an uneven starburst. “The minimal geographic extents of the grids in Charlotte and Honolulu are completely overwhelmed by the winding roads of the suburbs,’’ Kadish writes. “Downtown Boston has some gridded streets, but the suburban grids are differently aligned, dampening the expression of a single grid on the rose diagram,’’ Kadish said. Why does that make it harder for residents and tourists alike to figure out where they’re headed? People tend to think in terms of the four basic cardinal directions: Turn left from a northbound street, and you know you’re headed west — or at least, west-ish. But when grids aren’t laid out flush with cardinal directions, if you don’t have a mental imprint of the city streets, it’s hard to know if “west-ish’’ will take you to Allston or Jamaica Plain. Kadish, who arrended Brown University in Providence for graduate school, said he knows from first-hand experience how those off-kilter blocks can make for a bewildering navigational experience.